Blue and yellow fabrics rise like mizzenmast sails across the span of the 110 Freeway, punctuating every bridge and off ramp. These are the only places most Angelenos see the homeless — somewhere along their traffic corridors. Julian asks his mother: “Are we home?” There are just the two of them, and their tent is roughly in the middle of the Vernon Avenue overpass, heading south of downtown LA. Not a great spot — loud, exposed, and crowded — but out here they don’t have much choice. Julian is eight and his mother, Juana, is Mayan and petite. They represent the fastest growing segment of the homeless in Los Angeles: women and children. All of this is occurring amidst a construction boom in luxury housing. In South Park, situated between the new “heart” of downtown LA and the USC campus, new one bedroom apartments average $5000 a month. Meanwhile, nearly 15,000 affordability covenants on existing low cost units are set to expire over the next five years. In the face of this crisis, both City and County government have sprung into a flurry of action. The Mayor and City Council have placed a $1.2 billion dollar bond measure on the November ballot. The County Board of Supervisors has asked California Governor Jerry Brown to declare a state of emergency to pave the way for urgent funding. Los Angeles has had a homeless crisis for decades, but the recent escalation has been dramatic. The character of homelessness in LA has changed. 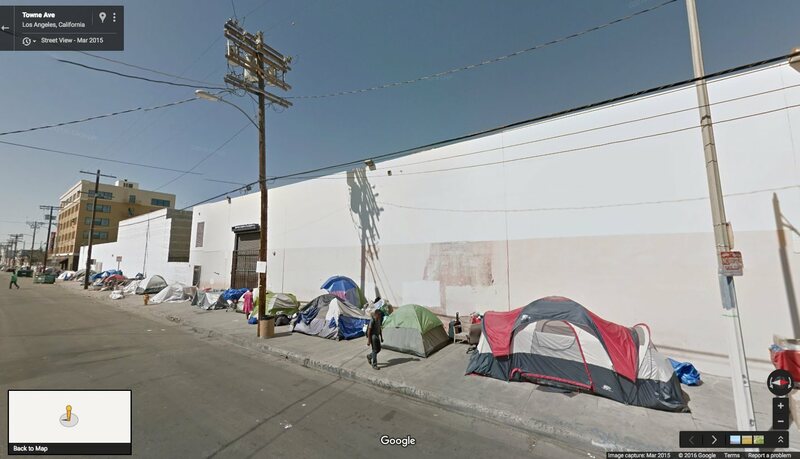 Until the past three years, the homeless were concentrated in downtown’s Skid Row. Furthermore, downtown itself was underpopulated and largely undesirable. When Skid Row was the homeless capital, the response was largely, “just don’t go there.” The core strategy was avoidance. That response has now become impossible. The homeless situation has a new feature: it’s everywhere. Tents pop up on sidewalks all over the city — under bridges, freeway overpasses, and along commercial thoroughfares. Herds of RVs, like antelope migrating the Serengeti, pour off the interstate and line affluent residential streets. Homelessness in LA has become a diaspora phenomenon. It is a situation redolent with irony: due to energy conservation and mass transit concerns, overall the City of Sprawl is becoming more dense. Downtown LA now has its own nickname — “DTLA” — as the not-so New Urbanism has made it the “coolest” place to live for the young and the hip. The supply of new housing throughout Los Angeles, particularly downtown, cannot keep up with demand. Old flophouses and Single Room Occupancy (SRO) hotels are becoming condominiums and lofts. Displacement of the poor is rampant. With no rooms to rent, those once marginally housed are now not housed at all. Geographically squeezed, former Skid Row residents and the newly homeless push shopping carts and pitch tents literally all over town. Los Angeles slums are horizontal slums, not the high-rise tenements of older cities. Probably the best book about American poverty thus far this century is Harvard sociologist Matthew Desmond’s Evicted. Researching inner city Milwaukee, Desmond found that one of every eight moves a renter makes is due to eviction or forced dislocation. For African American tenants, the ratio rises to 1 in 7; for Latinos, it is 1 in 4. I have no doubt that a study of Los Angeles would yield similar results. Evictions have become a cruel “farm system” for homelessness, helping to account for the rapid rise of homeless women and children. The place where the Sunset Boulevard bridge crosses over Glendale Boulevard in Echo Park is the center of the hipster universe in Los Angeles. It is also abuzz with immigrant street vendors and home to both a Burger King and a McDonald’s. It is the location of Angelus Temple International Church of the Foursquare Gospel, founded and built in 1923 by Aimee Semple McPherson, a celebrity pastor who would occasionally ride her motorcycle up to the pulpit to preach. Most nights and weekends, its 5300 seats are full of mostly young, mostly white churchgoers, who arrive in buses and ster clear of the bars and speakeasies that dot Sunset Boulevard. On some evenings, two long lines crisscross beneath the bridge — one for bible study at Angelus Temple, the other for the latest hot band playing the Echoplex. In short, the place is a crossroads — LA-style. Recently, it has also become an encampment for the old-school homeless — grizzled men, primarily African American and Anglo, no women or kids. Their tents start under the shelter of the bridge, then spread right along the sidewalk in front of the two fast-food burger joints. First four or five tents, now 12 to 15. The men gather inside McCafe for cheap coffee. Paul has been unemployed for ten years, homeless for six. He is 40 plus, or anyway he appears to be. He looks like he has fallen off a horse, though not smited by the Holy Spirit. He has two full shopping carts. Like the Bedouin, these nomads must take their belongings with them wherever they go. Two months ago, Paul “moved” to this location — from downtown’s Skid Row. He feels safer here, but he misses his friends. Displacement (and consequently, “placelessness”) is the 21st Century crisis, with parallels all over the world. It is a natural byproduct of our current form of globalization, which has produced historic levels of inequality. The Syrian refugee crisis poses the most visible example, but, at varying scales, the issue is ubiquitous and universal.